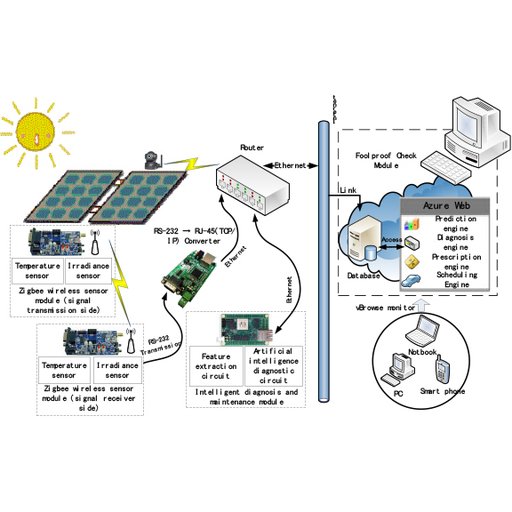 In this research, an intelligent maintenance scheduling system for gaining the maximum performance of a solar-energy-generating system is proposed. In the system, the particle swarm optimization (PSO) algorithm is used for the intelligent maintenance scheduling of the solarenergy- generating system. The maintenance center receives many maintenance prescription requests from all solar-energy-generating stations. For various uncertainties, the optimal solution of maintenance scheduling is considered. To reduce maintenance costs and improve maintenance efficiency, the intelligent scheduling system using the PSO method is constructed. In the maintenance scheduling model, the maintenance time and prework time are set to be the optimal computing parameters, and the lowest cost is set to be the optimal target. By design and implementation, we can determine the advantages of the PSO-based intelligent system. It meets both requirements of real time and integration for intelligent systems. Experimental results show the advantages of the intelligent maintenance scheduling system for the maximum performance of the solar-energy-generating system; that is, such a scheduling system meets both requirements of efficiency and lowest cost for the intelligent maintenance of the solar-energy-generating system. Chung-Chi Huang, Intelligent Maintenance Scheduling System for Maximum Performance of Solar Energy Generating System, Sens. Mater., Vol. 29, No. 11, 2017, p. 1579-1588.